George Carruth started out as part of the pack of hopeful artists who travel the art show circuit each year, going from one competition to another in the early 1980's. But in a few short years, he took his love for animals, insects, flowers and the beauty of nature and transformed it into a thriving, multi-million dollar company. He left behind the security of a job in corporate America and along with his wife took a leap of faith and started carving stone full time in his driveway in Waterville, Ohio. 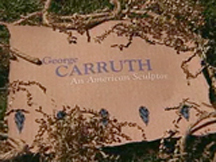 This documentary is the story of how he and his wife created this unique company and how this shy, soft-spoken man from Ohio has become one of the nation's premiere sculptors. Carruth designs are featured in dozens of national catalogs. His stone sculptures are in homes and gardens across the country and in addition to their production facility, he and his wife operate two retail stores, one in Waterville and the other in Columbus, Ohio.